You are here: Home Cat Jewelry 14k Yellow Gold Diamond Cat Pendant (.03 cttw, I-J Color, I2-I3 Clarity), 18"
This charming kitty pendant is definitely the cat's meow. 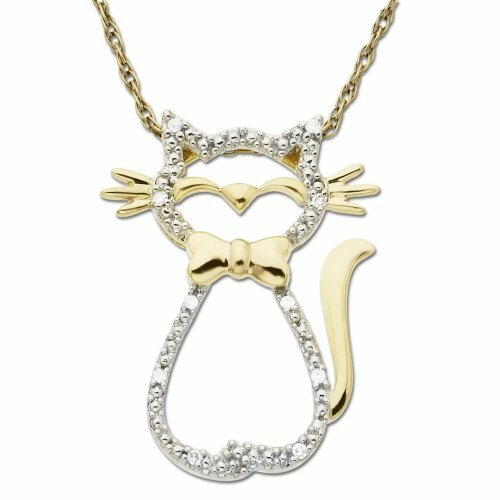 Fashioned in gleaming 14 karat yellow gold, and accented with ten shimmering round diamonds (.03 cttw), it makes a perfect gift for any feline fan. An 18-inch light rope chain, also in 14 karat yellow gold, threads directly through the top of the pendant to complete the design. Enjoy this pendant with the chain provided, or purchase a different gold chain of your choice.